2016, hand crushed ferrite magnets, linen thread, rare earth magnets, colour projections. Installed at Penrith Regional Gallery and The Lewers Bequest. Photos by Document Photography. Distant Orbits was developed during a residency at Penrith Regional Gallery and The Lewers Bequest. The House of Wonder residency was part of Gravity (and Wonder), a joint venture between Penrith Regional Gallery and The Museum of Arts and Applied Sciences. It was a collaborative project, where I worked in Lewers House alongside astronomer Andrew O'Brien of Western Sydney University for a period of six weeks. During this time we had many conversation about our respective practices, I visited the Penrith Observatory at Western Sydney University, we talked at length about the structure of the universe, and worked together to develop this site specific artwork. Distant Orbits reflects upon the universe as it might look, were we to be able to view it from afar in its complete form. In our universe, we understand that dark matter filaments stretch weblike across space, pulled by gravity into clumps where stars, planets and galaxies are born. Swapping out the force of gravity for magnetism, this installation is a weblike structure of linen thread held in tension by small magnetic clusters. Blue projections placed around the room offer dim light, a sensory experience that is suggestive of the fall into night-time. 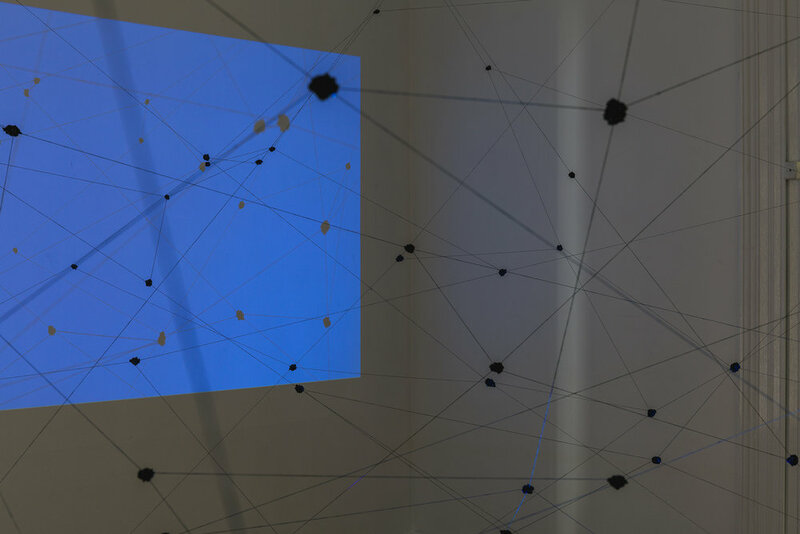 The shadows present a two-dimensional version of the installation, hinting at an astronomer’s view of far off celestial bodies through the telescope. Distant Orbits is a phrase from the poem When the Years Take the Stars Away by the Australian poet Carol Jenkins. It is from her book Fishing in the Devonian, published by Puncher and Wattmann, 2008.